We are seeing the return of song birds to our log bird houses here in our Whimsical Woods. Nest building is in full swing now. We’ve put up a few of our popular Bird Nester’s Huts around our house and enjoy seeing the birds pick out just the right type of material for their nests. It’s not too late though to get a few sent to you for your birds to start building their nest with. It is fun to watch! Note – the Bird Nester’s Huts come fully loaded with nesting materials. I would not be surprised if a few gnomes snuck out at night to grab a handful of brightly colored yarn or wool to take to their home for a new set of slippers. You just never “gnome” what they’re up to. The older birds will introduce the little ones to the kindness and help that the gnomes provide. Not uncommon for a group of crafty gnomes to help a little chick back into their nest if they were to fall out. The gnomes tend to hurt birds and often share their seeds with them. Keep that birdseed coming for a little longer. A sign of good luck and fortune is having a new bird nest near your house. Song birds and nearby gnomes are two very good things to have around your home. Add a gnome home and chances are they will be there. If you are smiling, they are already close by. That’s what happens. All is well. Birds are singing and the sun is out here at Whimsical Woods. 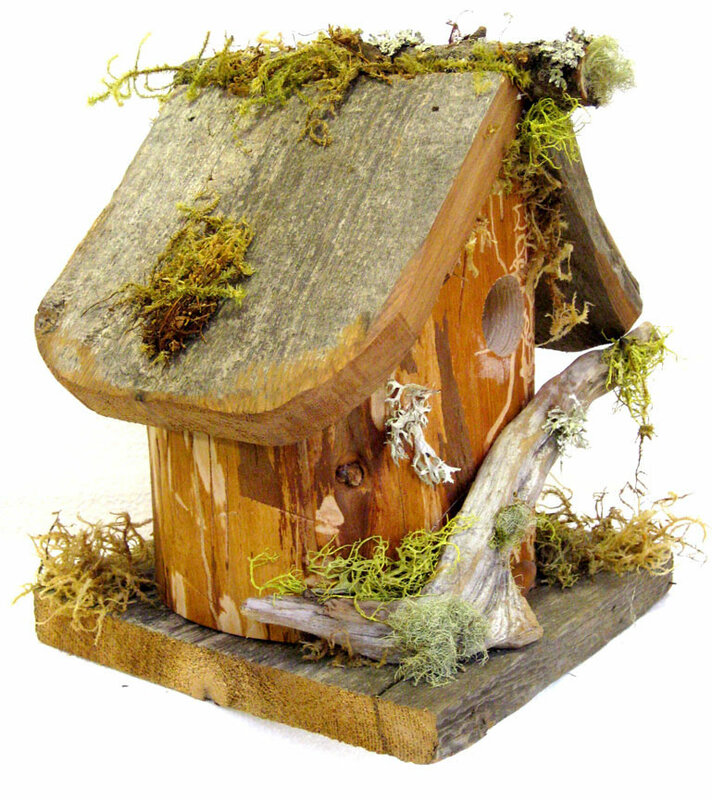 Our natural birdhouses are made from recycled old logs and barn wood and result in a very natural looking and functional birdhouse. The log is our canvas and the forest finds are our paints. All of our birdhouses are fully functional with approximately a 1.25 inch hole and a 3 inch removable clean out on the bottom. When spring returns, and it will, the nesting birds will be out looking for and gathering nesting materials that meet their needs. Why not put up an attractive natural Bird Nester’s Hut and watch the birds pick through your recycled natural materials with a beak full. Made to be hung on a tree, barn fence, etc. Just fill the “pouch” with natural materials from around the house. Preferred is dog hair, horse or goat hair, alpaca fur, strings of wool or cotton. 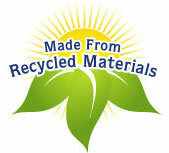 Just be sure to use natural materials, not synthetics. When used in a nest, synthetics will become brittle and the nest will fall apart. 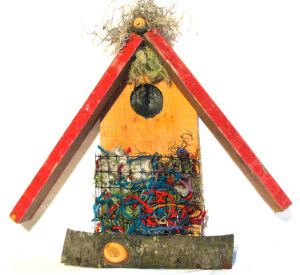 Bring some color and help the birds with the addition of a Bird Nester’s Hut, now available on our website, http://www.whimsicalwoods.net. The Bird Nester’s Hut is available with either a red roof or natural wood roof. as their main food source, live bugs, are gone. Homemade mixtures are easy to make and are much healthier and cost less than the commercial suet cakes. Side-by-side tests prove that birds prefer the fresh suet/lard mix over the store-bought cakes. Lard is easy to obtain and comes already rendered, like Crisco. You should be able to find it at your local market or specialty food store in tubs or 1 lb packages. We buy a 5 gal. bucket at a restaurant supply outlet. To the lard, I add a generous amount of sugar and oatmeal (the quick-cooking kind which I pulverize in a food processor), which seems to stiffen up the mixture. It doesn’t need refrigeration, but should be kept cool. Add birdseed if you wish. The birds want the energy to to keep warm. If you have a special recipe and/or photo, please share it with us. Have fun. Need a feeder? Drop us a line. I recently came up with a design for a bird nesting materials “box” and named it a Bird Nester’s Hut (after a naming contest on our Facebook page). 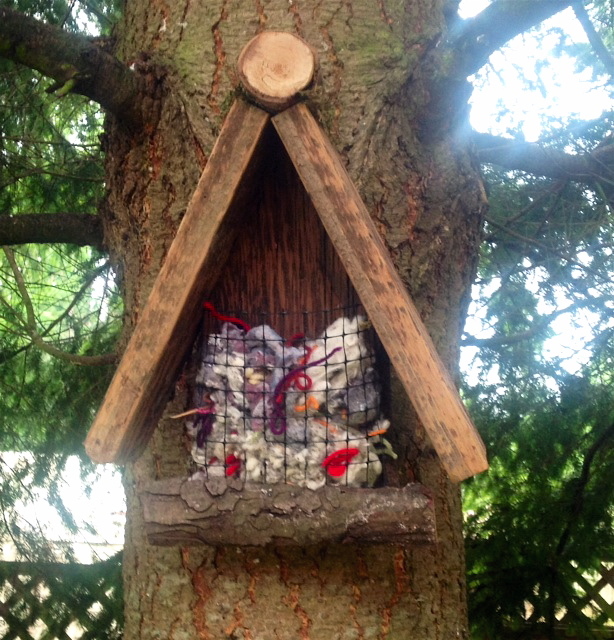 The box/hut is filled with all natural fibers (wool, yarn and fur) that the birds take to build their nests. Come to find out, something else seems to be taking the warm and natural material, fur, for their own use. Now, who could be doing that?? Just like missing berries from the garden, I’m thinking our gnomes have found the perfect source for natural fur for bedding and spinning into their clothe. Why not? An alpaca bed and jacket. Throw in some fur lined boots and gloves and you have a very happy, warm gnome! I have plenty to share, thanks to our local fiber artisans. The Nester’s Hut is not on our website, but contact us or visit us at the Sequim Saturday Open Aire Market, starting May 4. 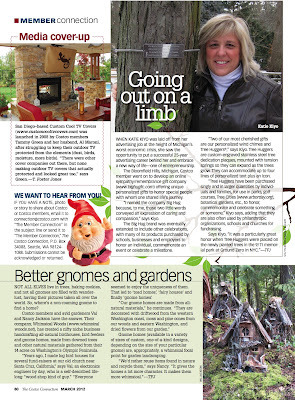 Whimsical Woods is in the Costco Connection Magazine! 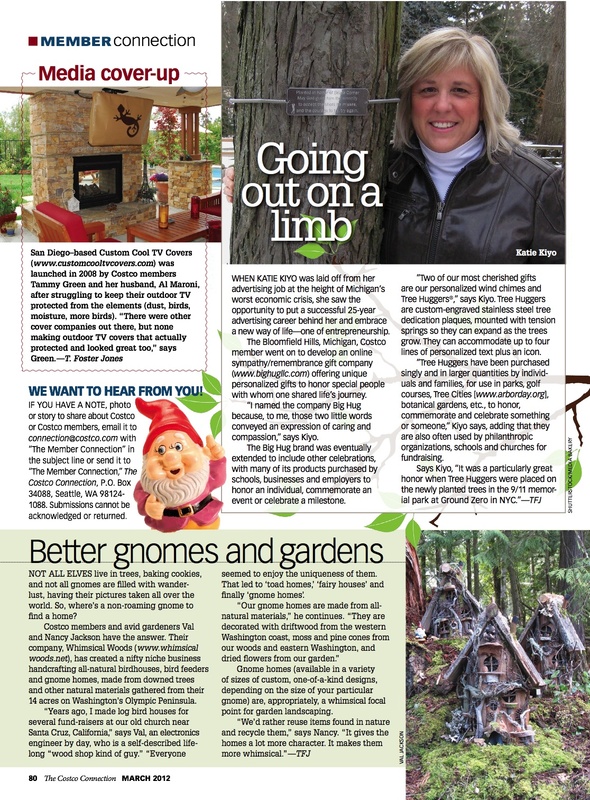 Whimsical Woods in the Costco Connection magazine! This is obviously a big event for us. The magazine is mailed to approximately 8 million Costco members and we have been receiving email inquiries, phone calls and orders from all over the US in response. We’ve been working with Costco on this for the last 6 months and were thrilled that they took interest in our creations and wanted to feature us in their magazine. We are very flattered and now quite busy! From our Whimsical Woods to your homes, a very Merry Christmas and Happy Holidays. From our crew and little fellows here, we all thank you for your support in 2011. 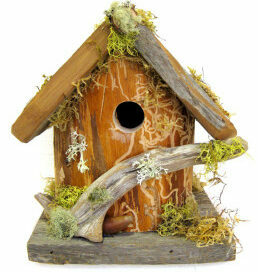 We appreciate your mail, photos and your orders for special log bird houses and custom gnome homes. Thank you all again. Please send us your feedback and your own photos so we can share the fun we’re having. (val@whimsicalwoods.net). All is well. Merry Christmas and Happy New Year! Winter Days Continue – Oh Nuts! > Spring is still a couple months away with long dark nights and short cloudy days. The weather doesn’t seem to bother our Whimsical Woods gnomes however, They continue about their daily chores and activities. Repairing their homes and wood gathering takes up a lot of their time. There is always time for fun however. I imagine snowball throwing, sledding and hide and seek games. I also imagine gnomes help the animals find food and remind the squirrels where they hid their acorns and my bird seed. With a barn or two nearby, a group of gnomes can haul away a good amount of high priced horse or rabbit food in a single night. At home here, we put out a little tub of various nuts and they disappear very quickly. 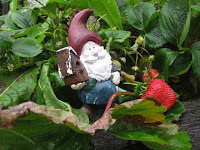 Gnomes do not seem to like citrus, but put out a strawberry and it is gone in no time! Not sure they eat it all, but like to share with the small rodents and other creatures of the forest. They are very responsible and loyal to those who help them. Hopefully, they have learned that from us over the centuries. That is a good thing. With that, this is nuts! But likely to crack you up! Sorry. All is well. 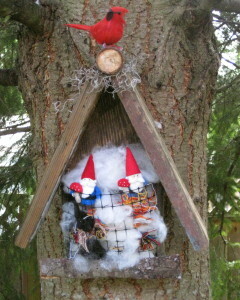 >As the wild geese begin their practice flights about our property, the gnomes have worked out a ride-along agreement. This is their preferred method of travel to visit clans and offspring that have settled in a nearby forest here on the Olympic Peninsula. We thought the geese were honking at each other, but maybe they’re communicating with the gnomes riding on their long necks! At 245 to about 300 grams, they’re an easy load for an adult Canadian goose. I’m sure the visits are short as there is much to do in preparation for the colder winter ahead. Hang on there! Garden gates keep the deer out of our garden, except when I forget to latch it, but that doesn’t stop our forest gnomes. Ripe strawberries look just like their little pointed red hats. I’ve got some to spare and do share, but will they take the whole berry? No! Just a nice big, round hole where they may have used a tool to carve out a section. They take a little from a different berry every night. The berries are organic and very sweet. Some rhubarb is left, so why not mini strawberry rhubarb pies? Just a thought. Better watch my raspberries! Gnomes are known to ferment them to make a potent alcoholic drink. Good thing they don’t drive! The gnome home got to her right on her birthday (yesterday), and she loved it. Thanks so much! Thank you again for the bird house! The girls and I are excited to have found a momma bird either building a nest or feeding her babies in our bird house right outside our sunroom window! This is so cool. Our daughter says it’s a chick-a-dee. Your new website is great, I love the slideshow, super photography! It is easy to navigate! Just found the testimonials which I didn’t see before on the old site!? Love your new products, great idea to add more gnome stuff too! I just happened to stumble on your website tonight and fell in love with the gnome homes you make! They are absolutely fabulous!! Hi Nancy and Val, I’d like to send you a GIGANTICALLY ENORMOUS THANK YOU for the most exquisite and absolutely beautiful Gnome Home you created for my daughter!We all can’t get over what a masterpiece it is! It’s much more than a Gnome Home – it’s a magnificent display of art!! The craftsmanship and detail are amazing beyond belief! Our daughter just loves it and will cherish for years to come. I’m not sure how you’re able to even part with such creation, however we’re sure glad you’re able to do so. Also, we’re positive this is a super upgraded model of the one we ordered, so we wanted to thank you for that. I see you meant what you said when you wrote “It will be worth the wait.” We wish you a cornucopia of success in following your passion. You deserve all the best. Good luck to you both! My mom will love the gnome home…she’s been carrying around the picture of the Costco Connection since it came out! Thank you so much! Nancy and Val: OMG, the Gnome Home is awesome and they are so excited with it!!! Thank you so much for the special touches from your beach trip. What a wonderful gift for my special neighbors who have been such a help to me. Thank you so much and God bless you both and your business. We have a few Whimsical Woods products at our home in the Santa Cruz Mountains of California. So far over the past couple years we’ve had 2 different “Black-Capped Chickadee” families living in the large Hobbit Style Birdhouse. 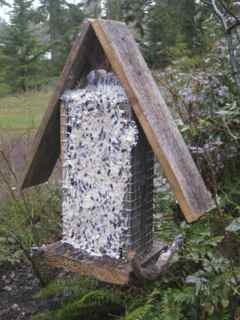 We also have a Suet Feeder which the birds love so much they fight over who gets to be first when we add new suet! Our two young girls love the magical “fairly-like” theme of the birdhouse, and the quality of how the birdhouse was made stands up to the winter storms common to the redwood forest. 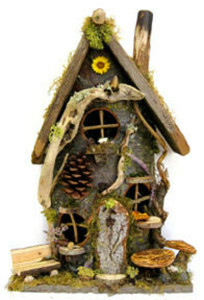 We will definitely add to our collection of Whimsical Woods products through the years to come! 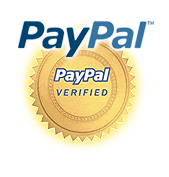 Our Site is Certifed Secure!